Since 1980, Mr. Wang works have participated in multiple national and international group expos as well as solo exhibitions in Washington DC, New York, Pittsburgh, Philadelphia, Los Angeles and elsewhere. "Zong Zhou Wang Week" was successfully held from June to July, 2012 in the 798 Art Zone Beijing, China. The Oriental Art Center held a painting retrospective of his featuring 40 oil paintings. The opening ceremony of the 1995 solo exhibition at Georgia Southwestern College was attended by former U.S. President and first lady Jimmy and Rosalyn Carter. 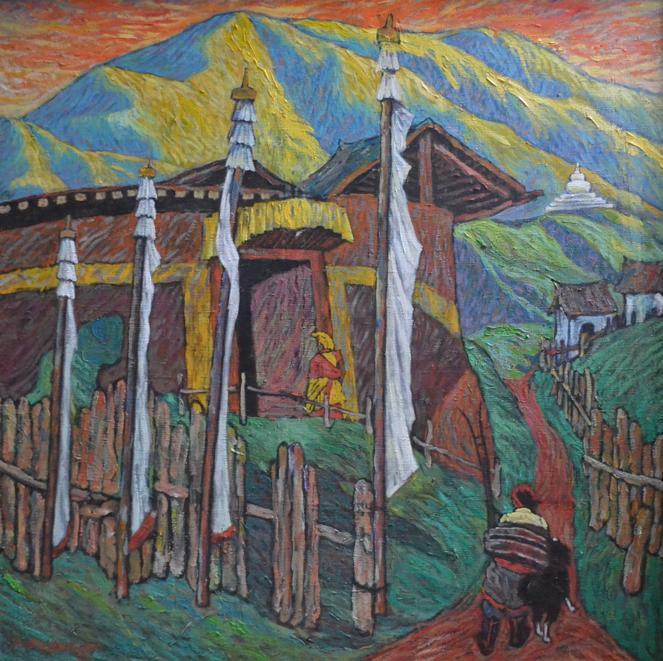 The college also added his Tibetan themed painting: "Father and Son" to its art collection. Mr. Wang's works participated in Fine Arts expos in Mexico and Taiwan, organized by the International Artists Association. In May 2008 six works were nominated to show in the Grand Expo of International Oil Painting Art, jointly organized by the China International Culture Exchange Center, the International Chinese Artists Association and the China International Book Trading Corporation. In May 2009, Mr Wang' s oil paintings Red Path and Girl Carrying Milk participated in the Contemporary Chinese Oil Paintings, An Academic Exhibition by Invitation In Celebration of the Sixtieth Anniversary National Holiday in Hong Kong, which was organized by the China Charity Federation and held in the Hong Kong Exhibition Center. In January 2009, Mr. Wang held a solo exhibition in the University City Arts League Philadelphia, which showed a selection of 20 paintings. 1993 - 2005 Philadelphia Sketch Club , participated in and organized art galleries and other exhibitions. 1995 - 1996 participated in the International Artists Association, held in Mexico and Taiwan Fine Arts Exhibition. 2008 - was invited by the China International Culture Exchange Center, the International Chinese Artists Association and the China International Book Trading Corporation jointly held in Macau "International Oil Painting Art Exhibition ", there had six oil paintings in exhibition. April 2009 - Oil Painting "human body", attended the Philadelphia Sketch Club's 146 painting exhibition. September 2009 - oil painting "Light at Dawn", "A plateau Girl", "Quiet Silence Silent Night" and five other works in Philadelphia"s "Original Oil Painting Art Exhibition of the overseas Chinese" at International House in Philadelphia PA.
Collection: Oil Painting "Spring Bud","Quan-ming birds, "Red Road" are in Beijing, China Artists Association, Beijing, China oil painting gallery part of the China Central Television collection. "Tibetan Girl, "Snow Love, "Wilderness, "A Lili, "Red Cloud","Water Snow","Sun Tree "and"Silent Forest ", and many paintings are in the United States, Japan, Sweden, Germany, South Korea and other countries in the hands of collectors. Part of the collected works were also published in the "North American Works of Chinese Artists","Letter to the World of Chinese Art Paintings","Selected Works of Contemporary Art Beijing"and the catalog.